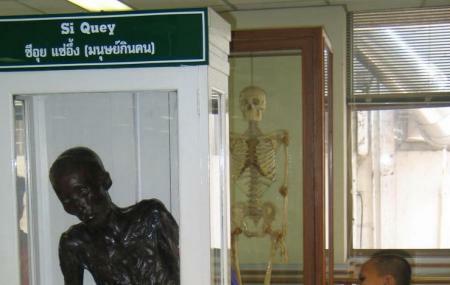 One of the most unique museums in Asia, the Siriraj Medical Museum, also nicknames the Museum of Death, is an excellent display Centre for learning about the medical profession. Medical students and teachers get attracted to this place given the rich resources and history of medicine that it has to offer. From exhibits about human anatomy to tools and appliances found through excavations of prehistoric graves, there is a lot to learn at this incredible place. Watch out for the mummified body of the Thailand’s most psychotic serial killer, Si Ouey Sae Urng, a cannibal who preyed on children in the 1950s. How popular is Siriraj Medical Museum? People normally club together Wang Lang Thai Dessert (tib) and Tha Chang Wang Lang Pier (tha Chang) while planning their visit to Siriraj Medical Museum. The best place to visit if you want to see something incredible about yourself, literally. You'll see the intricate anatomy of the body as well as the potential abnormality that could arise if it was you. Highly recommended! I'll go back soon especially I am a curious buff! I hope more people can see and appreciate the world of medicine! Limited English translations however this only slightly detracted from the experience as there were audio assisted headphones available at the desk. Not for the faint of heart or children as it is visually rather traumatic and gruesome, however it is incredibly interesting and the best way to source information on forensic matters. I would highly recommend taking the challenge to find this museum and attend as the locals are very friendly and ready to assist, and if it interests you then the pay off is well worth it. Very cool collection, worth a stop for sure! This place really is great and pack full of oddities. The anatomy building is really where it’s at for me, such a wild collection packed so densely. 200 baht, for 300 you get access to the history museum near the river as well, very worth the price. Nothing like this place. You’ll feel exhausted by the end and it’s not for the faint of heart, but a truly fascinating museum.